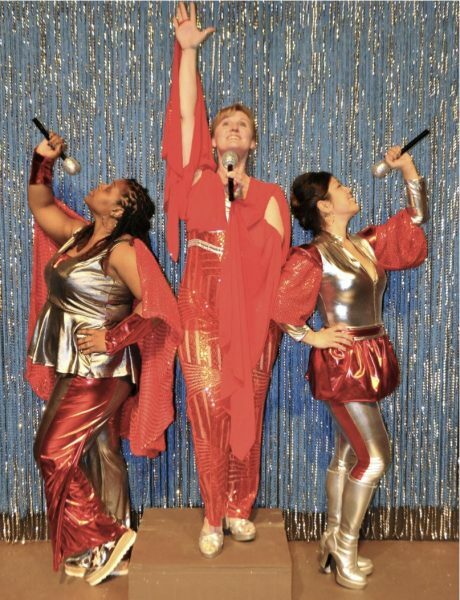 Rebecca Garrahy stars as Donna featuring Patricia Anderson as Tanya and Alana Simone as Rosie in Charm City Players’ production of Mamma Mia!. The storyline for this beloved musical seemed a little over the heads of the 12 and under crowd that amounted to nearly half the audience for the hit show “Mamma Mia!” presented by Charm City Players in Baltimore. However, the electricity generated on stage permeated throughout the auditorium and the show was a delight beyond my expectations. “Mamma Mia!” brought all the disco frosting and glitter that made this such a lauded production –first across the pond and then in America. This show was truly a fuzzy, warm-feeling kind of show and I recommend taking the kids before it ends March 24. 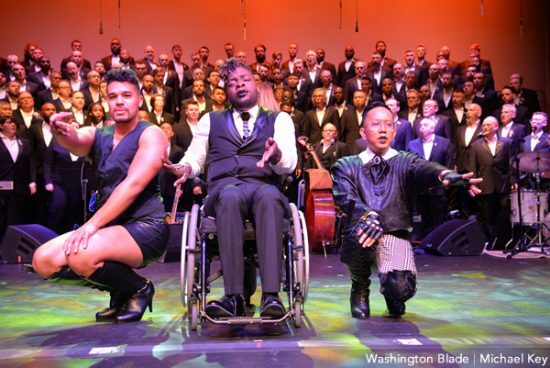 As someone who grew up in the ’70s, I simply could not resist feeling a flood of emotions during the musical numbers, so I wondered if the parents and grandparents in the audience were welling up, too. The flashy costumes, the crazy bell bottoms and high heel boots, and the large choreographed ensemble choked me up –mostly because of the memories attached to the songs. Though I admit, the wedding scene did a real number on me because my preteen daughter was sitting next to me and the thought of that moment for her in the future was too much for me to handle. That aside, the show was far more charming than I anticipated. I give a lot of credit to the costumiers Tara Hebert, Patricia Anderson (who also played Tanya) and Emmie Grant for the lovely attire –as everyone looked quite comfortable in their beach shorts, as well as the disco getups. The ostentatious and loud habiliments for “Dancing Queen” was exceptionally eye-catching. Director Stephen Napp put together a wonderful show that was mostly family-friendly and totally fun to watch. The music level was a bit low and a little muddy, but the energy and excitement of the production were too lovely to resist. Scenic artists Annmarie Pallanck and the director himself put together an attractive resort façade and practical stage set up. Overall, the aesthetics of this production deserves a bit of praise –from the venue (the Harry and Jeanette Weinberg Auditorium at Mercy High School) down to the final musical number, “Waterloo.” This show was truly a fuzzy, warm-feeling kind of show and I recommend taking the kids before it ends March 24. For more information about Charm City Players and to purchase tickets, visit their website by clicking here.